Mary Ellen, 88, passed away Sept 28th quietly and free of pain in her sleep, after fighting many years of health problems. She was preceded in dealth by her Father (David Manwill), her mother (Helen Manwill) and her sister (Kathy Lathim). Mary Ellen was born in Salt Lake City in 1927. Her family moved to Santa Barbara, CA when she was 6 months old. Her father went to work for Ambassador Laundry when they arrived. She lived the care free days in Early Santa Barbara, along with her sister, Kathy, who was two years younger. She went to La Cumbre Junior High and finally to Santa Barbara High School, finishing her schooling at Westminster College in Salt Lake City, then moved back to Santa Barbara. She worked at the Bank of America on State Street for many years. In her early years she loved to ride her horse alongside her father in the fiesta parades. She was married in 1951 to Mel Cokeley and they lived in Carpinteria until 1961 when they moved back to Santa Barbara. They had two sons, Mike Cokeley (1953) and Mitch Cokeley (1958). She worked several different jobs when she could while raising her two boys. Later in life she helped raise her two Grandsons Mitch Cokeley Jr. and Rayce Cokeley. She loved being a mother and a Grandmother. Mary Ellen loved going to the desert to hunt for rocks. Many times their motorhome was dragging it’s rear bumper with the weight of her finds. She also enjoyed spending time at San Antonio Lake during the summer months with the Lathims. She loved to travel all over the USA with her family, but she mostly loved being with her family around the pool at the lathims or just sitting around her house. 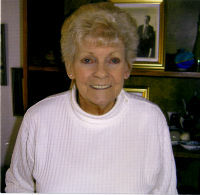 Mary Ellen loved life and enjoyed all her family and friends. Thee will be an open house at her home October 11th 10am to 2pm to celebrate her life and good times we all had together.. Please no flowers, we have plenty.